Stop wasting your money on chemicals, clunky flat irons, curling irons, hot rollers and crazy gadgets that just fry your hair! The TrueCeramicPro features a solid ceramic heater and baked ceramic plates to create fast, consistent heat that keeps your hair healthy day after day. 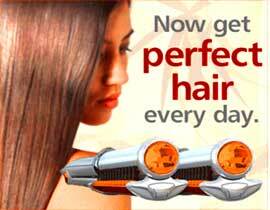 The negative ions then seal the hair cuticle which locks in the moisture, color and shine! It straightens, flips, curls and more! It’s fast, easy and works on any type of hair! No more damaging hot and cold spots! locking in the moisture, color and shine! Save money by creating salon looks at home! Repels the effects of humidity!